I installed our Zoomcharts lib with npm in a webpack project. I has tried to use 'babel-loader' and 'import 'babel-polyfill'' to solve this problem, but it not work. What can I do with this error? thank you! v1.18.8 is okay in chrome. The most important thing I forget to say is it is fine in IE 11. I used the latest version from npm, but It is also not worked in IE 10.The project build with babel-loader in webpack and run with plugin babel-polyfill in explorer， so I don't think the ES5 syntax will affect the run result. It is strange that it works well in IE 10 when I used the same version 1.18.8 witch is loaded with inline script type. 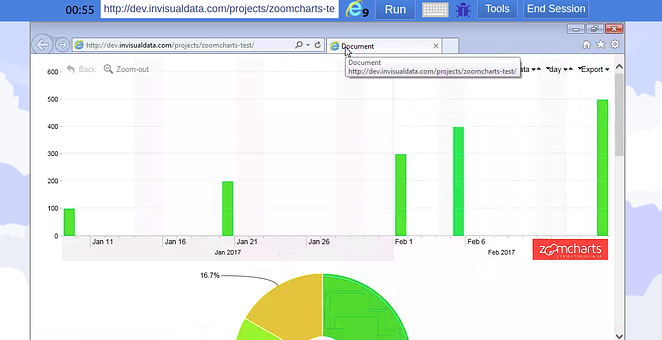 currently, the @dvsl/zoomcharts package uses the es5 version, so it may be difficult to work with older versions of the browser (supported by <es5). It is possible that an error occurs due to this reason. To solve this problem I would recommend a webpack-es3-plugin that helps to convert the code into a format supported by older IE browser versions.